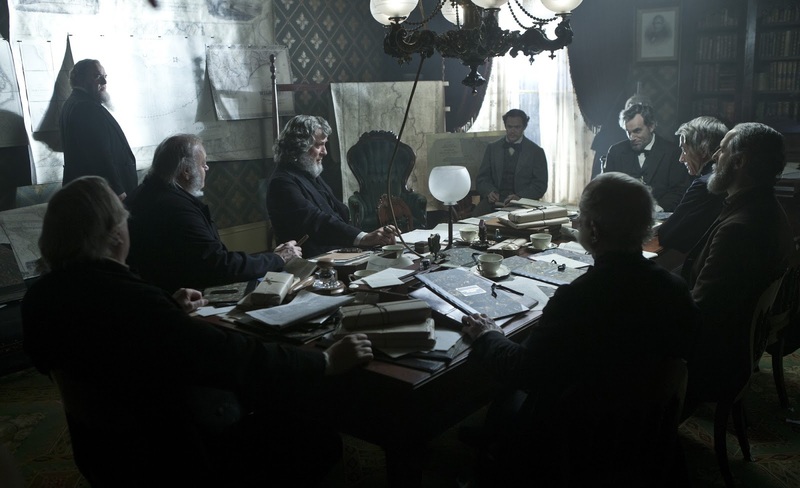 Lincoln tells the story of the 16th President struggling to make the Emancipation Proclamation a reality. Fighting an uphill battle trying to get the Thirteenth Amendment to pass, President Lincoln also has to deal with a civil war, arguing political parties, an anxious son ready to sign up for battle and an unkempt hair style. 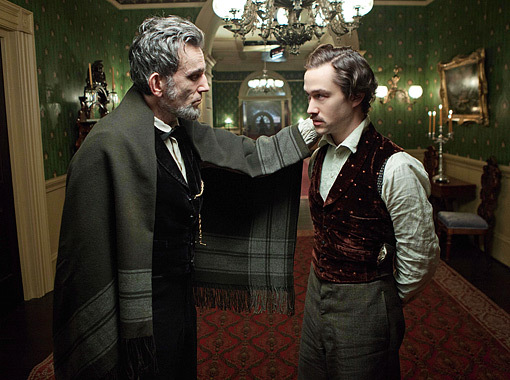 Lincoln has been a long-worked on project for director Steven Spielberg. Development started on the project over ten years ago. I remember reading when Liam Neeson was set to star as Abe (I thought he would be pretty good). I had been looking forward to seeing this film since I first heard the plans about it years ago. I always found Lincoln a fascinating figure and who doesn’t admire the guy? Now after years of research and a cast full of recognizable actors Spielberg’s Lincoln has arrived and not surprisingly it has garnered some pretty high praise. So what did I think about it? I liked it. I was hoping for much more though. There is a lot to like about Lincoln. The film covers the final four months of Lincoln’s life, focusing on the passage of the Thirteenth Amendment. It’s an interesting portion of time. There’s a lot happening here. Lincoln just got reelected. The nation has now been at war for four years. The country is exhausted and just want an end to the carnage. The issue of slavery has become a focal point of debate and no one can seem to come to an agreement on it. The production design is all top-notch. They really captured the smoky, dim-lit rooms I would imagine there were in 1865. It’s a much more confined film than I would have thought. There really are no sweeping city shots of DC. Most of the film takes places in offices and hallways. It makes the film feel somewhat claustrophobic, but maybe that’s what they were going for. The costumes, hairstyles, all those goofy whiskers guys had back then, all of that made me feel like I was dropped into the mid-19th century. The actors all give good performances. Despite having such recognizable name actors in the cast such as Tommy Lee Jones, David Strathairn, James Spader, Hal Holbrook, they all made me accept I was watching these characters. That goes the same with Sally Field. I thought she was very good as Mary Todd Lincoln. However, the real reason to see the film is Daniel Day-Lewis. He has gotten accolades and I’m sure awards are headed his way and he deserves every one of them. He is fantastic as Lincoln. He’s got almost a beaten down presence about him, which makes sense after what he’s had to endure for the last four years. But he also has that inspiring, quiet quality I always associated with him. I don’t know how he decided on the voice to give his Lincoln, but it was an inspired choice. The politics and legal maneuvering that is being done to get the needed votes in the House of Representatives in order to guarantee the passing of the amendment is all interesting stuff. Arguments back and forth, the convincing, the pressure, it’s entertaining to watch. Despite everything I liked about the film, I felt it to be a very dry exercise. The importance of this amendment and the message it would send to the entire country and throughout history, I didn’t feel much emotional stake in. The gravity of it and the then radical views anyone associated with supporting it would be branded with it, just didn’t have the weight I thought it should have. The fact this was such a sensitive topic and once someone went out on a limb with his support of it, has the makings of a lot of intense personal drama and conflicts. The idea of free slaves was viewed as offensive by many people at the time. So someone actually having the courage to voice their opinion of supporting it would be a pretty hefty decision and could alter their political career and private life I would imagine. I never got that heavy drama from Lincoln. The film feels simply more like a historical account of the proceedings. We get the names and events, but they’re less of characters with personal beliefs and more like a textbook course with very little emotional investment in the final outcome. I found it odd that for a film that’s focusing on freeing the slaves, we are never really shown slaves. The film takes place in DC where blacks are servants in the White House, some are in uniform, but we never actually see the ugliness of how the majority of blacks who were enslaved were being treated. We never get a glimpse of the conditions of the South and the treatment of slaves. These are the people who the amendment would mean the most to. Instead we really only see the white politicians arguing about it. That might be the main reason why I felt the film to be somewhat of an emotionless exercise and it came off as more of a history lesson. You can’t just rely on John Williams to tug at my heart strings and Day-Lewis telling amusing anecdotes, there has to be something else there to get me invested in this struggle. I think the film could have illustrated what a life altering, historic piece of paper this was and what it would mean in other ways rather than just through monologues by politicians. It could have also included not just the moral arguments of what the Thirteenth Amendment would mean, but also the financial implications it would have within the country, particularly the South. We hear from the ones opposed to the passing of it who were against it because they did not see blacks as equal, but I’m sure there were other considerations on top of that which kept many opposed to it. Unfortunately, we don’t hear those. The film detours into a subplot of Lincoln’s son Robert (Joseph Gordon-Levitt) wanting to enlist in the army, but it feels crowbarred into the story for the sole purpose to add some poignancy for Lincoln and allow Mary to get hysterical. It doesn’t work. They should have just kept the focus on the amendment. The History Channel has a show that showcases a military film and in between segments a real military officer explains the real history versus the film history shown in the film. I would be very interested in seeing something similarly done with Lincoln with Lincoln experts confirming or contradicting what’s illustrated in the film. I’m no Lincoln scholar, but I have watched many documentaries on Lincoln and was questioning some of the things presented in Spielberg’s film and the historical accuracy of it all. Day-Lewis’ Lincoln is simply a good man who wants to free the slaves against his opponents, but I’m not sure it was as black and white as that. He was a politician afterall. Spielberg’s simplified Lincoln is the easier way to present the character, but I think he was a bit more complicated than that. 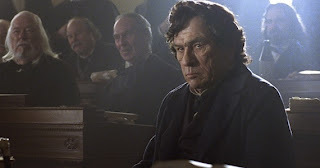 Lincoln is worth seeing, if for nothing else to see Day-Lewis’ performance. The film will probably be used as teaching tool in school, but anyone really interested in learning about the man would be better served watching one of the countless documentaries or reading one of the thousands of books about him. Can anyone suggest a good one? 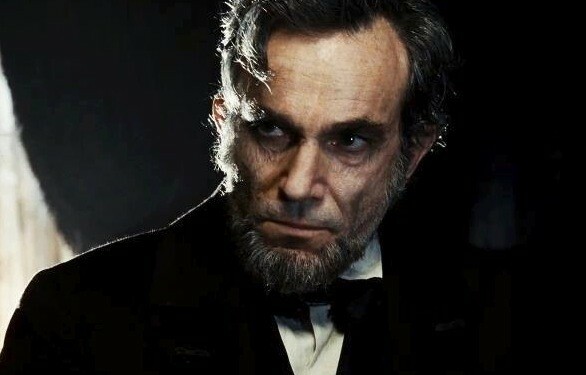 Daniel Day Lewis sent Steven Spielberg two rejection letters after turning down the lead role in Lincoln twice, It was only when playwright Tony Kushner's original 500-page badly written script for the two-and-a-half hour epic was narrowed down to its final form that Day Lewis agreed to take on the part of the American Civil War President. but Lincoln has its moments – and it has Daniel Day Lewis – but for so much of its running time, it’s visually grim, dramatically dull, very painfully boring and Spielberg's weakest direction. It also goes on several scenes too long. It could have ended with Lincoln walking down the hall, leaving for his final carriage ride to the theatre but Spielberg drags it out like he can’t bear to let go, doing a Peter Jackson on the poor doomed man.